All members of Animal Samaritans are invited to attend our Annual Membership Meeting on Wednesday, May 9, at our clinic lobby. *You must be a member to attend; you can become a member at the meeting; memberships start at $25. Our veterinary clinic is located at 72120 Pet Land Place, at the Animal Campus in Thousand Palms. The meeting, which includes a review of the organization’s strong 2011 financials and summary plans for 2012, is expected to run from 6pm to 7pm. Members may also submit Board Member nominations. A question and answer period will follow the presentation. Refreshments and light appetizers will be served. Please leave your four-legged guests at home for the meeting. If you plan to attend, please RSVP by contacting Sandra Viden-Martins at (760) 343-3216 or Sviden@animalsamaritans.org. Volunteers enjoy dinner, drinks, and live music while the Josyln Strummers perform on stage. Animal Samaritans staff and board members were delighted to serve and entertain approximately 85 deserving volunteers at this year’s annual volunteer appreciation night. Executive Director Fred Saunders, aka Chef Fred, prepared an Italian feast that included pasta sauce made from scratch, garlic bread, salad and desert treats. Volunteers also enjoyed complimentary wine and beer. The event was held at the Joyslyn Center’s theater, where the Josyln Strummers and steel drumming musician Bart Bollen performed for the crowd. Karen Clark has been a wonderful asset to both our animal shelter veterinary clinic. Her energy and sense of humor is refreshing. At the clinic Karen spends her time comforting and assisting customers and their pets in the lobby. At the shelter her warm greetings and assistance always makes people feel welcome. Marlene and Larry Clark are a couple who like to take road trips together! While on those road trips they save lives by transporting our rescue animals to rescue groups and no-kill shelters. Without hesitation, they say yes to the great adventure of saving a life! Sherri Halstead has been the heart and soul of AnSams’ Animal Assisted Therapy (AAT) program for years. She spends many hours with her dog Elvira at schools and hospitals, and as an AAT leader has the unglamorous task scheduling program visits. Sherri also conducts behavior testing for the program’s incoming dogs. Nominated by AnSams, Sherri was a 2011 local CBS TV2 recipient of the Jefferson Award for her excellence in volunteerism and community service. 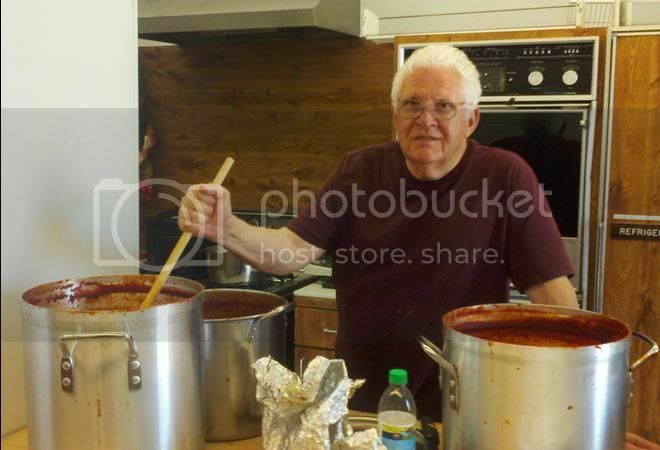 Executive Director Fred Saunders prepares his homemade spaghetti sauce before the event. unteer of the Year honors. Kimberly Nelson has been a faithful and dedicated volunteer at the animal shelter. She rides the Sunline Bus at least 3 times a week to help us out. She cleans animal kennels and cages, feeds the animals, socializes them, whatever we need. Roma Reed is the godmother of pet foster care; she has fostered dozens of sick puppies that without her, would not have lived. Is she a softie? Yes! And do we take advantage of that? Perhaps. But our pet foster program would not be a success without her. Even though Rafi Snowden has not been volunteering with the organization very long, she has been a tremendous help since day one. She comes to the shelter every day, stays all day long, and helps with whatever needs to be done. Her love and compassion toward the shelter animals is undeniable! Jennifer Uberti‘s pet fostering assignment with Wobbles exceeded everyone’s expectations. Wobbles couldn’t walk and had a questionable future. In fact, the vets recommended the puppy be put down. But thanks to Jennifer’s love and care for Wobbles, the puppy is walking and now has a future!